My daughter’s dog (a.k.a. our household’s resident diva) has been living here almost a year, and never would sleep in the first dog bed we bought. When she was a puppy, she took the cushion off the rocking chair (shown in this post) and decided it would be her bed. That worked out all right because we already had two of those cushions; but then she discovered that she could chew a hole in it and pull out the stuffing—way too much fun for a little puppy to resist! After the shreds of the cushion went bye-bye, she still wouldn’t sleep in her bed, as she much preferred to lie down outside my daughter’s bedroom door at night and make sad noises to try and get herself let in. My daughter soon had enough of that (as did we all!) 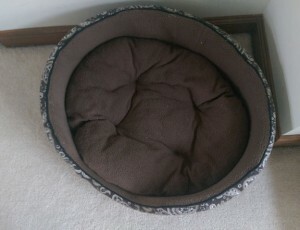 and bought another dog bed in the style of a large rectangular cushion to put outside her bedroom door. The new bed was sturdy enough that it didn’t suffer the same fate as the original cushion, and Diva Dog was happy enough with it that she stopped the nightly tragic-opera performances. But that left the old bed, as always, just sitting empty. Diva Dog uses it occasionally as a hiding place for her rawhide bones and other prized possessions; but really it’s just clutter, and needs to be given away. I expect my daughter will move into her own place in a few months, once she finds a good rental house or apartment, taking both the dog and the preferred bed along. Even though we’ll probably end up doing some amount of dog-sitting here, there’s no sense keeping a bed that the dog refuses to sleep in!